We Can Be Biodiversity Heroes! What is a Biodiversity Hero? Firm in the belief that people should know the living things around them to understand the need to conserve them, biodiversity expert and business leader Dr. Nonn Panitvong is popularizing taxonomy and helping it become more accessible to the general public. After studying Business Administration, Dr. Nonn started working for his family business in 2001. He then decided to pursue his interest in the environment by working for a PhD in Environmental Science at Kasetsart University. His thesis, the Ecology of Cyrtodactylus sumonthai: a karst dwelling bent-toed gecko from southeastern Thailand, is still the only long-term ecological study of nocturnal Gekkonid in Southeast Asia to date. 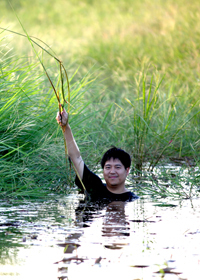 He helped establish Siamensis.org, a group of taxonomists and keen amateurs who document and promote Thailand’s rich biodiversity. Members of the group are bridging the knowledge gap between the country’s few taxonomists and the Kingdom of Thailand’s 65 million people. By developing a web-based biodiversity database, web board, and Facebook Dr. Nonn and his group play the crucial role of educating the public about biodiversity in Thailand and in the ASEAN region. His science-based approach is instrumental in helping the public understand key environmental issues such as the negative impact of releasing invasive alien species and constructing a dam in a rainforest stream. Dr. Nonn and his group started only with freshwater fish and aquatic plants enthusiasts. They soon attracted more people from different kinds of fields. Within a few months, a herpetologist joined the group. Then came an entomologist and other experts. The loose nature of the group broke the barrier between institutions and government organizations. According to Dr. Nonn, his group started in 2001 with only a web board. They gradually added more features to the website until eventually added the Species Index, currently the largest online natural history museum in Thailand. Working in Wikipedia’s style, the Siamensis Index allows anyone to add the pages to the Index under moderation of keen moderators. Those who do not wish to navigate through the page building process, simply donate their images to be used in the index. The index has grown so large and trusted that it is rare to visit a conference on biodiversity in Thailand without someone referring to the information or using photos from the Siamensis Index. Dr. Nonn takes pride that his group is directly or indirectly responsible for the discovery of over 50 species which are new to science and span various taxa. Dr. Nonn himself was involved in writing the description paper of six species. His first was a species of cave Isopod, Stenasellus mongnatei, which he wrote with late Dr. Guys Magniez and named it after the late village headman, without whom the limestone mountain would have already been turned into limestone quarry. The discovery helped them win the Green Globe Award in 2009. Siamensis’ Facebook page now has over 18,000 members. Dr. Nonn’s group has become one of the leading forces in biodiversity conservation in the kingdom by simply turning taxonomy into something that is accessible to anyone who has access to the internet. It has also become a major clearing house in terms of identifying organism in news from all over the country, such as a troop of caterpillar that invaded a house, a weird fish caught by local fishermen, or even proposed mystical Naga’s footprint. Through his keen eyes, sheer persistence and sometimes good luck, Dr. Nonn has photographed and learned a lot about the natural world. Over the years, his photos have been published in leading websites, newspapers, magazines, and text books locally and internationally. He has also been a guest lecturer in various leading universities in Thailand on subjects such as Ramsar sites, freshwater biology, effect of extinction, and invasive alien species. He also had a leading role in the study of the newly discovered population of Trigonostigma somphongsi, a critically endangered species of fish in IUCN list. His research led to the first-ever publication of its natural habitat. Dr. Nonn Panitvong is currently a Board member of Bird Conservation Society of Thailand (BCST), Thailand’s Birdlife Partner, and the oldest conservation organization in the country. He is also a board member of Green World Foundation and a member of the technical support group for Wetland Conservation Board, run by the Office of Natural Resources and Environmental Policy and Planning. A successful business leader, Dr. Nonn is also a key figure in the area of business and biodiversity. He has started the process of mainstreaming biodiversity conservation into policies, operations, products and services in his and in in others’ businesses.